Large Detached Property, Garden, Superb View, Garage.. The town of Revel, which is in the east of the Haute-Garonne department of south-west France, is a market town lying on a flat plain, resplendent in early summer with sunflowers and poppies. Corn and garlic are also grown here, agriculture being a dictator of the changing seasonal landscapes as always in rural France. A market town par excellence! Its Saturday extravaganza truly is a superb example of a French general market at its very best. Revel has a huge Saturday morning market which is attended by both locals and visitors, some of whom have travelled considerable distances to savour the atmosphere and the goods on offer here. The hub of the market, the food and fresh produce stalls, are situated in the central market square, which is a gorgeous covered arcade, typical in its bastide styling, yet more beautiful than most. The market spreads out around the town, but the heart is most definitely here in this very traditional square. The rest of the town is again very typical of its area, with Toulouse coloured pink brickwork in evidence, often with the fancy pebble patterns so popular in the Haute-Garonne. There are all the usual shops and facilities that you would associate with a large town, and the big city of Toulouse is not far away as an added bonus. Close to Revel is the Black Mountain, or the Montagne Noir, so named because the densely wooded slopes give the impression of darkness. 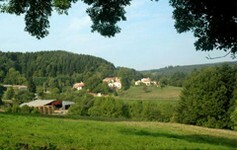 The Montagne Noir is, in fact, an extremely pretty area, and excellent for fishing, horse-riding and walking. Should you find yourself in Revel in the summer time, there is no better way to spend a day than swimming in the clean waters and sunbathing on the sandy beaches of the Lac Saint Ferréol, the beautiful lake close to Revel. A favourite with the locals, the lake is safe and pretty, set in pine forests and with numerous activities possible. There is tennis, boules, windsurfing and sailing available, and all along the road opposite the lake are restaurants and cafés, offering a wide choice of cuisines and prices. The Chinese restaurant is particularly good, and has an opulent décor which belies its very reasonable prices. The market at Revel deserves more than a cursory mention. Classified as one of the most beautiful markets in France, there seems no end to the options of things to buy… don't take too much money or you could find yourself heading home with a live chicken or rabbit under your arm! There are fashion stalls, selling clothes ranging from hippy-style cotton skirts and scarves through to designer goodies at rock bottom prices. You can equip your kitchen with the best quality pots and pans, and perhaps treat yourself to a new sewing machine, if that's your bag. The absolutely undisputed heavyweight champion of the market, however, is the fresh produce and foodstuffs section, situated in the covered arcade. There are cheeses from the Montagne Noir, chestnuts and walnuts, fresh baked breads in shapes and sizes never seen elsewhere, glossy fresh fruit and vegetables, and the most divine aromas floating in the air to whet your appetite. These emanate from the BBQ chicken stall, which spit roasts chickens and hams and cooks potato chips in the fat under the spit (delicious), and even better, the Aligot stand. Aligot is a local delicacy of mashed potato, cream, garlic and Cantal cheese, and its preparation is a theatrical performance deserving a little of your attention. The mixture is lifted repeatedly and turned on huge wooden paddles until the consistency is judged just right, at which point you can buy it to take home… or probably, because you can't bear to wait, to eat then and there. Don't count the calories though! Reaching Revel is simple, as the town is within an easy drive of Toulouse, which has an international airport served by several airlines (BA, Air France, bmi, bmibaby, flybe and Aer Lingus) and also a TGV station. Less expensive than Toulouse, yet with many of the benefits, Revel can provide a great opportunity to purchase reasonably priced property in a very desirable area. Property types vary, with everything from old town houses, through to new build on the lotissements on the edge of town. Most desirable of all are the lovely country houses and farmsteads in the countryside close to Revel and on the lower slopes of the Montagne Noire. Do you know Revel better than we do? Do you have photos of Revel? Revel is located in the south-west of France, in the far east of the Haute-Garonne, very close to this department's border with Tarn and the neighbouring region's Aude department. Access: By air: The nearest airport is Toulouse, which offers services directly from the UK with a variety of airlines, but it is also possible to fly to Carcassonne or to Montpellier. By rail: Toulouse has a TGV station, making rail travel fast and efficient. Economy: Revel is known for its quality furniture shops as well as for its market. Interesting fact: The market at Revel was heavily featured in the television series "French Leave" which charted Chef John Burton-Race's year in the south-west of France.